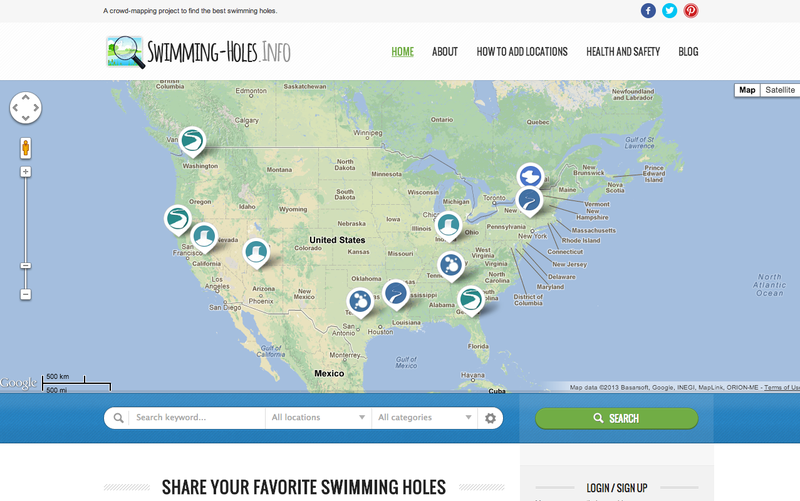 Welcome to Swimming-Holes.info, a crowd-mapping project to find the best swimming holes. The point of this website is simple: to draw on the wisdom of the crowd to collect, map, review, and comment on swimming holes. What is a swimming hole? It can be a river, creek, lake, pond, waterfall, or spring. These natural watering holes are a treasure to find and experience – one visit can provide a lasting magical summertime memory for those both young and old. The very nature of swimming holes are that they often exist off the beaten path. Usually, only a few locals know how to find them. Our view is that this information should not be kept secret. That’s why we launched this website – to turn the tools over to you, dear visitor. You can directly contribute information to this map, comment and rate on specific swimming holes with your findings, and share links to specific swimming holes on social media. It’s important to be respectful, act safely, and follow all laws regarding trespassing on private property. When people don’t behave respectfully and safely, swimming holes inevitable get shut down and closed to access. Make sure you use your head, stay safe, and leave these swimming holes as beautiful as they were when you found them. This week’s spotlight user-submitted swimming hole is Ithaca Falls: This is probably the best-known swimming hole in Ithaca. Right near the schools, and visible from the road. Plenty of people from the neighborhood nearby walk there on hot summer days. Great spot for a dip and a picnic.